We offer Fluke Multimeters used in day to day life. Our Fluke Multimeters are accurate and rugged meters for electrical maintenance and troubleshooting. 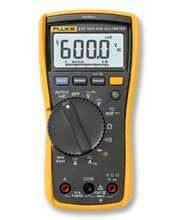 A typical Fluke Multimeter includes features such as the ability to measure voltage, current and resistance. We procure our Fluke Multimeters from reputed vendors in the industry who make sure that these provide precise results within short time period.